You never know what will happen when you hit the road. However, arriving with no expectations, makes for the best recruiting experiences. Yes, there are the schedules, you know when the event starts at 9am, age group, location of the gym or hockey rink. In October a group of us from the college headed north to LaCrete, Alberta. We would drive for about 7 hours, take a ferry, check in at the only hotel, set up at the gym, eat dinner at the only restaurant and or course snag some LaCrete Cinnamon Buns! Easy trip. Talk to dozens of kids grades 9-12 from communities like; like High Level, Fort Vermillion, Rainbow Lake, Rocky Lane etc. Done Deal! No bites, kitten caught. Now what do we do with him? Upon catching said kitten, Katie the Animal Health Tech instructor walked out of the restaurant. I couldn’t put him back on the ground to meet his impending traffic fatality future, but I also couldn’t keep him. My arms shot straight out and I passed him off to Katie. She wouldn’t turn him away, “she works with animals so she must love them” that was my logic. It was decided Kitten wasn’t going anywhere, but where could he stay for the night? It was our first night there and we were staying in a hotel that had NO PETS signs plastered everywhere. 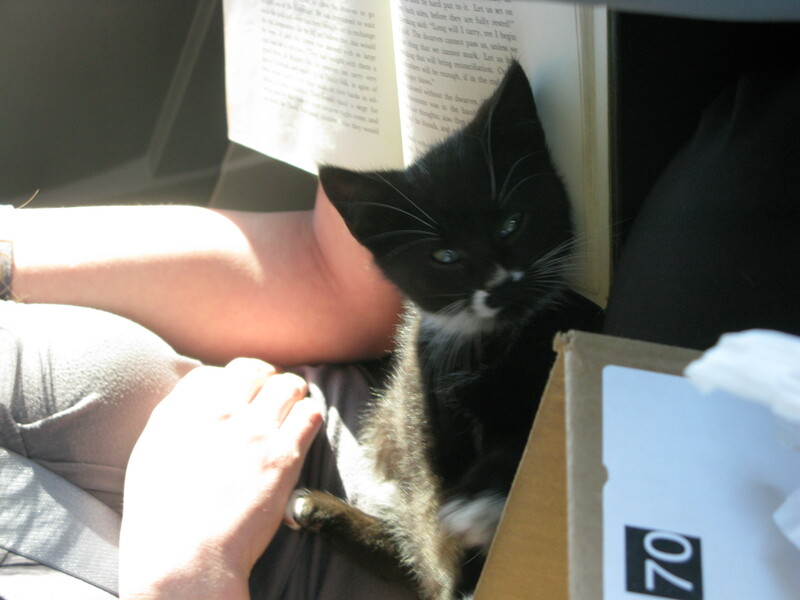 After a brief stay in the hotel room where he proceeded to be a crazy kitten, we decided to set him up in the trailer that had been used to haul some motorcycles for the school event. Kitten tucked in, we all went to bed. All of his needs fully met the next morning when the hardware store opened. Day done, tearing down and heading home. Again what to do with this kitten? He would need a home. Myself and Katie had already maxed out our personal pet quotas. So, I put a post on Face Book. Within minutes he was spoken for. We hadn’t event pulled out of the school parking lot. And so the unnamed LaCrete kitten now goes by Zazzles and lives near LaGlace. A good days work and for this recruiter and social media. Great blog – Way to use Social Media to take care of an animal in need – well played!